Every tournament organizer knows how hard it is to sort out stacks of entry forms, draws and matches to have a great tournament. Tournament Planner is designed to manage any type of tournament and provides you practical, and professional capabilities. As you know by your own experience, managing tournaments can be a very time-consuming trick. Tournament Planner offers lots of functionalities with unparalleled accuracy and efficiency. Tournament Planner supports many types of tournaments. You can have as many knock-out draws and round-robins per event as you like. Also consolations and playoffs are supported. Tournament Planner is the most user-friendly software you will find. Use one mouse-click to schedule a match, print a draw, show different events and more. You can always use the built-in help function, but all your available functionalities are always visible on the screen, so you won't need to read a 'bible-size' manual. In the easiest way possible you can publish your tournament on the internet, so not only the players, but also their parents, the press and fans can look at all the results. All this happens just by connecting to the internet and press a single button: no difficult settings or any internet knowledge is needed. 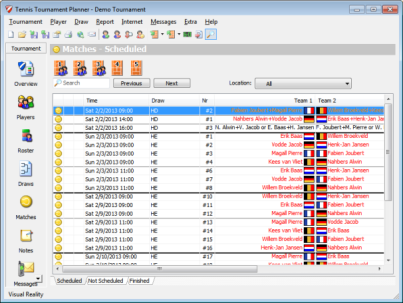 Easy scheduling, using player availability, court availability, other matches etc. Consolation and playoff in an elimination draw, or round robins with knockout finals. It's all possible! Setup your days and timeslots. Help is available throughout the program. Overview of scheduled, played and unscheduled matches. Create backups for your safety or data-exchange. Round Robin standings are calculated real time after entering results. You can define your own calculation rules. Re-schedule matches without unscheduling the match. Schedule all matches for your round robin's at once. Publish your tournament on the internet. All your draws and matches can easily be published on the web!